The Plantronics CA12CD - USB Adaptor cable. 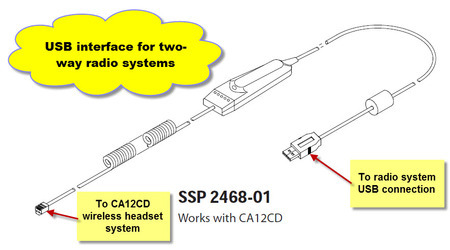 AAAHeadsets carry stock of the CA12CD and all associated PTT accessories..
Now you can integrate quality wireless communication with your modern USB interfaced two way radio system. Replaces your two-prong push-to-talk plug adaptor. Simply unplug the curly console cable from the base of your CA12CD unit & plug this cable in it's place - it's that easy!